MANILA, Philippines — Sen. Ferdinand "Bongbong" Marcos Jr. on Tuesday addressed doubts on his educational record, insisting his online profiles are truthful. "To set the record straight, my educational record as posted in the Senate website and in my own official website is accurate," Marcos said. Marcos' profile on the Senate website lists his Bachelor of Arts Philosophy and Economics education from Oxford University in England, while his Masters was from the prestigious Wharton School of Business in Pennsylvania. 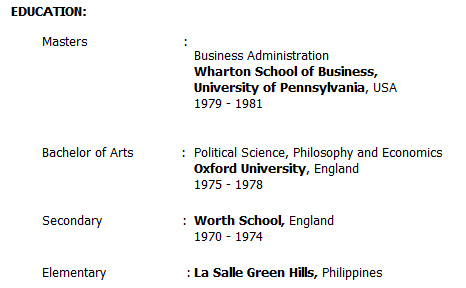 Screencap of Marcos' educational record on the Senate website. Reports show, however, that Marcos did not complete the degrees and may have received mere diplomas instead. In his statement, Marcos said he earned a "diploma in political science at St. Edmund Hall, Oxford University in England in 1978." He then did post-graduate studies at Wharton, but was "unable to complete the course." "I was elected Vice Governor of Ilocos Norte and had to return home to serve my provincemates," Marcos said, referring to the years 1980 to 1983.